Deathstate is a game Matt Leffler and I have been working on at Workinman since 2013. It has grown a lot since then and it is now available on Steam for pc and mac. 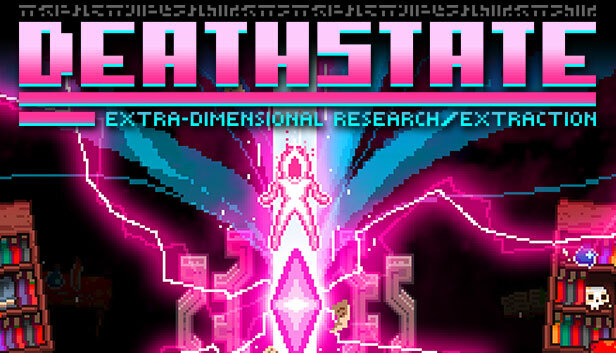 Deathstate is a roguelike, bullet hell, single stick shooter set in a bizarre world of dimensional exploration for pc and mac. You play as a number of unique characters trying to discover the fate of Professor Elinberg who opened a portal to the void. Great and terrible mysteries and even greater treasures await if you are bold or foolhardy enough to go beyond the beyond. And visit the Deathstate page on Steam! DEATHSTATE (C) 2015 Workinman Interactive, LLC.